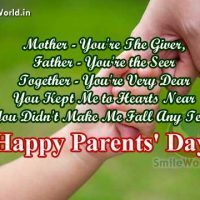 If Your Are Looking For A Wishes / Greetings / Ecards for Parents Day Here Big Collection of Happy Parents Day Images, Messages, Wallpapers and Greeting Cards Download and Share With Your Facebook and Whatsapp Friends and Family. 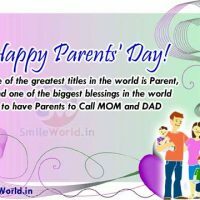 One of the greatest titles in the world is Parent, and one of the biggest blessings in the world to have Parents to Call MOM and DAD Happy Parents’ Day!! No love is greater than Mother’s love!! No love is greater than Mother’s love, And no care is better than Father’s care. Happy Parents’ Day! Your strength and love has guided me!! Your arms were always open when I needed a hug, Your heart understood when I needed a friend, Your gentle eyes were stern when I needed a lesson, Your strength and love has guided me and given me wings. Happy Parents’ Day! Thank you for being my life! 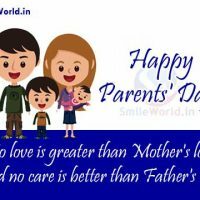 Dear Mom and Dad, I never expressed in words as how much I love you but today I want to thank you for the wonderful gifts, your blessings and your teachings in making My life meaningful. Thank you for being my life! Happy Parents’ Day! You Didn’t Make Me Fall Any Tear. Mother – You’re The Giver, Father – You’re the Seer, Together – You’re Very Dear, You Kept Me to Hearts Near, You Didn’t Make Me Fall Any Tear. Happy Parents’ Day! 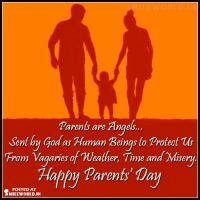 Parents are Angels… Sent by God as Human Beings to Protect Us From Vagaries of Weather, Time and Misery. 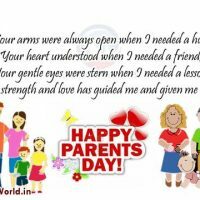 Happy Parents’ Day to all These Wonderful Angels!